The Liberal National Party today selected 32-year-old out-spoken journalist Gavin King as their candidate for the State seat of Cairns. King's successful nomination follows the dumping of former Cairns councillor Paul Freebody, who was embroiled in a nasty email spur, bringing the party into disrepute. The only other candidate contesting the LNP selection was Kim Anderson who heads the Great Barrier Reef International Marine College. Barron River LNP candidate, Blazing Saddles owner Michael Trout, congratulated King's selection. ''Now we have a strong team for Far North Queensland. We will listen to local concerns and we will deliver for North Queensland under a Campbell Newman led team,'' Michael Trout said. Cairns Councillor Rob Pyne says it's a shame that Kim Anderson wasn't selected, saying he is a "bloody good bloke." "Kim's work with the Maritime College and the training opportunities that he created for students at local schools, including Woree High School, is great." Cairns Mayor Val Schier said Anderson has a lot more experience in business, when comparing him to Gavin King. Gavin King will battle it out against Labor's Kirsten Lesina, the sitting Division 4 councillor for Cairns, and former policeman Darren Hunt, now representing Katter's Australian Party, formerly The Queensland Party. King was until recently, the editor at large of the Cairns Post, and comes with formidable name recognition, and an articulate grasp of local issues. King's divisive personality, will not please everyone, but with Labor way behind in the State polls, he will likely pip Labor's Lesina. With a large swing against the Labor expected at the March State election, it is very likely that Barron River and Cairns will fall to LNP or another strong independent. Curtis Pitt in Mulgrave holds a massive 14.5% majority over the LNP, whilst Cairns has a narrow and winnable 6.3% margin, infamously and continuously held by Labor for longer than most can remember. Barron River sits on a knife-edge with less than 1%, that Steve Wettenhall secured only from Green preferences at the 2009 election. Wendy Richardson won the primary vote. Kirsten Lesina is the youngest councillor in the history of the Cairns region, and serves on the Far North Community Jobs Priority committee and the Independent Rates Relief Tribunal. Whilst she is active in many youth issues, to see that younger people are engaged in local government, there has been much criticism that she has not served one term as councillor, when she sought the nomination for the State seat ahead on Labor union official Richie Bates. Don't you have anything serious to contribute anyMoore? I was just watching the very serious ABC 24 News tonight on events in Afghanistan. Meanwhile the news scroll at the bottom of the screen was that Dan Carter is out for NZ, Warney and Hurley may be engaged, and that there has been a stink bomb set off in a Collingwood Pub. Among those issues I think King should focus on the stink bombs? Although, if Kirsten could go in over the top of Hurley, so to speak, and snare Warney that could be the flipper that gets past King and saves her! King would look like a fool talking about stinkbombs in Pubs while Kirsten is bonking her way into the hearts of Kings core constituency! This is because boys love stinkbombs and also admire that Warney has got into Hurleys pants! It could be Kirsten's only chance to lure King into this trap! No surprise. King resigned from The Cairns Post after years of promoting and campaigning for himself to "stand" for preselection knowing he had it in the bag. This self-serving ambitious hack of Murdoch's is following the exact same modus operandi of media personalities campaigning for the "Tea Party" in the USA. American posters on my blog have told me that once selected the media machine then goes into full support mode for them. Michael Moore, the American doco maker, in an interview recently said that whereas the corporate media machine were totally ignoring the Occupy Wall Street demonstrations, any demonstration by the Tea Party, whether attracting fifty people or less, gets leading coverage. Oh dear, KS and Terry with the old Vaudville act “drunk and jaded – oops I’ve faded”. Rather than engage their drivel, I’m just going to declare my strong support for Gavin’s candidacy. 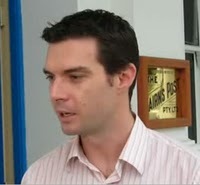 2012 will be an historic Queensland election, and Gavin is a strong chance to take the seat of Labor. To hold it, he’ll HAVE to perform. How well he does that is at least in part down to us. One thing is certain – by knifing an experienced and well-like union activist in favour of a callow obedient hack, the ALP have let us know about the utter contempt in which they hold us. Go Gavin you good thing! Good, make it as public as you can Bryan Law, that King reflects your views perfectly. Oh Terry, Gavin doesn't "perfectly" reflect my views by any means. He has his own thinking. He also has two qualities I like - honesty and integrity. Those qualities are currently alien to the stinking corpse that is Labor. Yes, Bryan, King has demonstrated the "integrity" to use his position on a newspaper to campaign for himself for several years. The "integrity" to abandon the impartiality of the media once and forever, the "integrity" to besmirch, insult, sneer and ridicule women community leaders and not male community leaders. He's definitely your type of man. "Honesty and integrity" huh Bryan? Ever ask Andrew Webster about King's "honesty and integrity"? No, of course you wouldn't. Oh dear Terry. Can't Andrew Webster speak for himself? For that matter can't you? What did you know, and when did you know it? Knowledge is power Bryan. Nice to see you have so much faith, trust, admiration and high expectations in Gavin. Bryan Law embracing "honesty and integrity"? The fat ffucker wouldn't know either if they were served up for his evening tea. Gee Mr Outlaw, get it right. I'm either a fat fucker, or a ffat ffucker. Fat ffucker is clumsy and inconsistant. Your legion of admirers expect better. One more reason to vote LNP. Campbell Newman accurately describes the ALP/TWS wild rivers legislation as “patronising”. Lets assume the incoming LNP government keeps its promise and designs wilderness protection legislation in consultation with traditional owners, and others (historical residents brought to the missions). I’ve been wanting to see this for twenty years, and its always fallen down because of ignorant and patronising whitefella greenies from the suburbs. Wouldn’t it be terrific to get it right this time? It won’t be easy. Aboriginal politics is not easy. But it is possible. If I think about the candidates for Cairns and ask “who has the best ideas and the best skills for addressing this issue in an effective manner”, Gavin King stands head and shoulders above anyone else so far. Let me repeat the goal: A wilderness protection regime in Cape York Peninsula with active support from traditional owners. I’ll vote for that. I couldn't agree with you more on this one Bryan Law. Gavin as the Member representing the Wild Rivers will be a conscientitious force in ensuing the traditional owners receive fair and equitable treatment from the mining companies.